These little guys are 15mm medieval crossbowmen. 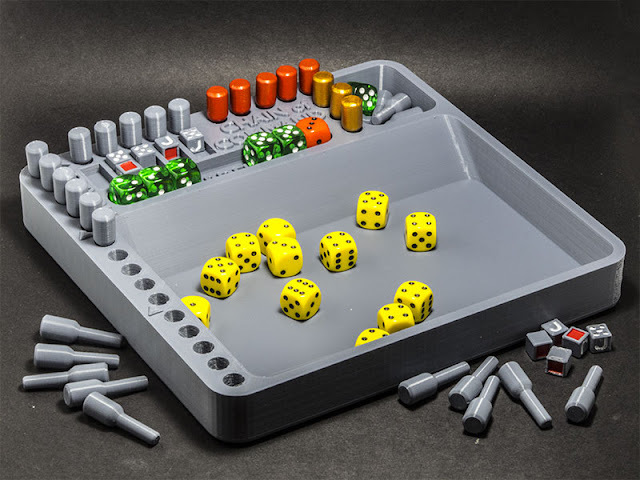 When I bought them, some years ago, they were being made by a company called Tabletop Games, long defunct, alas. The moulds now belong to someone else, I don't recall who, and they're still in production. I'm not completely sure how long it's taken to actually get them painted, but it has to be at least ten years. Nobody can accuse me of leaping in and rushing things, that's for sure. 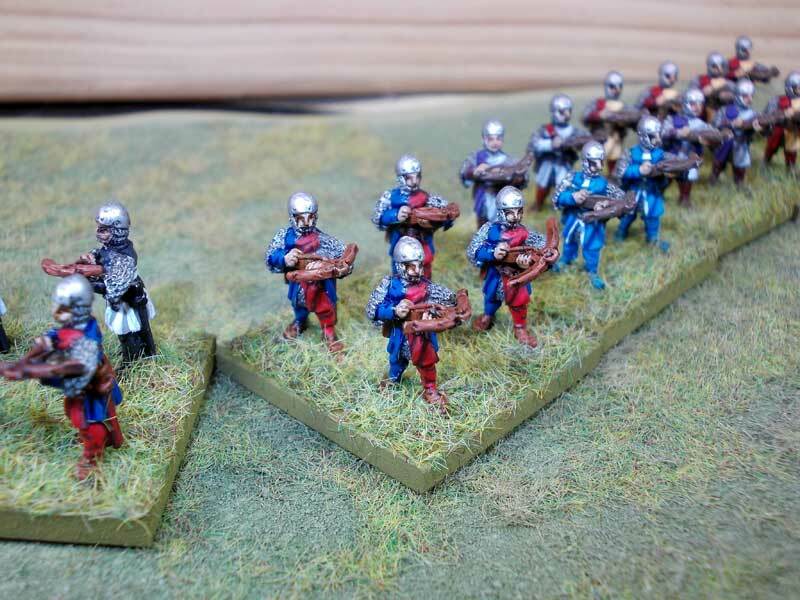 There are surprisingly few companies making 15mm medievals these days. I guess the period has fallen out of fashion or something. 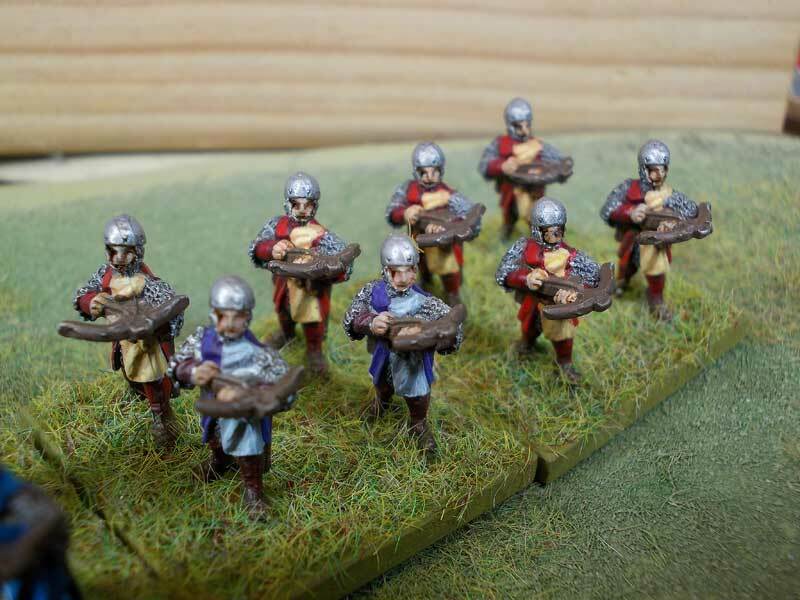 I've based them for use with the Hail Caesar rules. 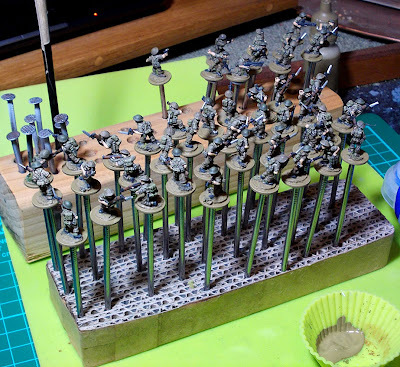 I'm in the process of re-basing some of my old Battlefront 15mm WWII British infantry on to individual bases for gaming with the Bolt Action rules. 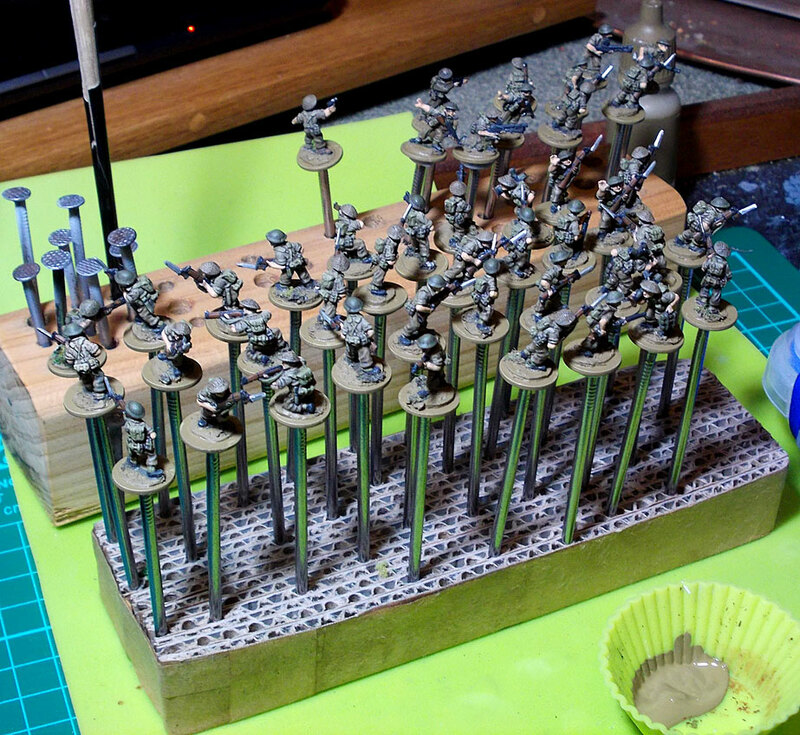 I've mounted them all on 12.5mm (½ inch) steel washers, so if I need to use them in another rule-set, such as Flames of War, I can put mount them on magnetic squad bases easily enough. One thing about using 15mm figures for skirmish wargaming, especially with my increasingly decrepit eyesight, is that the figures are small enough that I have to make an effort to see which ones are modelled with which weapons. In an attempt to make life a bit easier for myself in this respect, I've added colour-coded markers to the base of each figure, denoting their primary weapon load — in the case of the three pictured here, orange means a submachine-gun, pale blue a pistol, and white a rifle. Others include red for a light machine-gun, purple for an anti-tank rifle, and black for other man-portable AT weapons such as PIAT, bazooka, panzerfaust or panzerschrek. The little coloured doughnuts are tiny glass beads — highly reflective, and easy to distinguish from a distance. 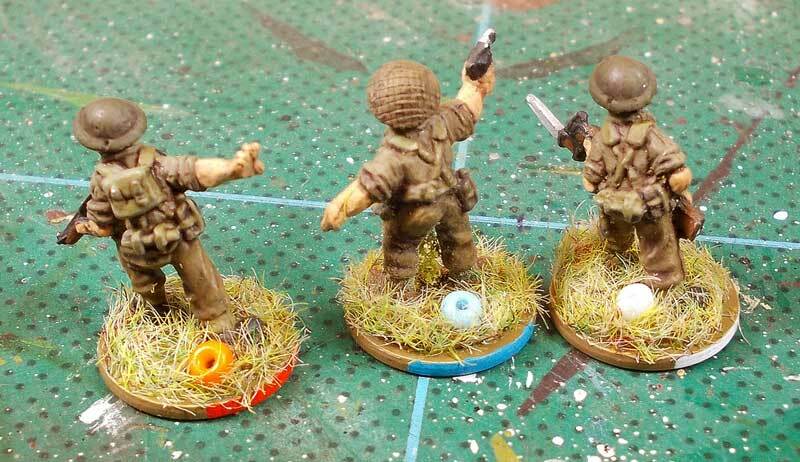 The paint on the base edge, as well as distinguishing the model's weapon, indicates its rear quadrant, on the off-chance that that might become important. Newly-arrived today are some early-WWI British infantry and a single solitary 18 pounder field gun, from Peter Pig. 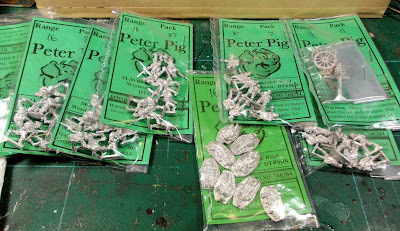 They're very nice little figures, and Peter Pig's service is top-notch: I ordered them just six days ago, and they're already here in New Zealand all the way from the UK. That's the fastest turnaround I've had from any overseas company anywhere. I'll be basing them on washers, just like the WWII figures above, and as well as fighting various small colonial actions, they can stand in for VBCW militia and the like. 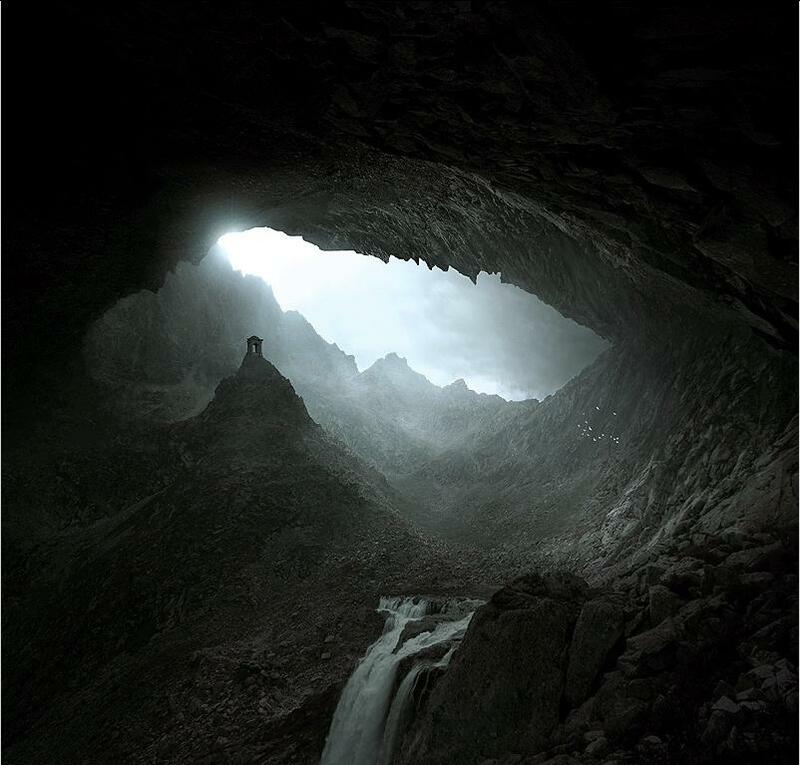 The small gazebo-like structure just outside the cave mouth is a watch-tower with an alarm bell to warn when the dragon emerges from its decades-long sleep. It's a low-odds russian-roulette suicide post; if you're on duty there when the dragon comes, you're almost certainly going to die, but you could go your whole career in the Dragon Watch without there ever being an alarm.